Offside in Soccer stops the game, and turns over possession. OFFSIDE IN SOCCER MAKES THE GAME INTERESTING AND CONTROVERSIAL. Many people are confused about offside in soccer games. Offside in soccer is enforced by the referees on the sidelines, as they have the best angle of view to determine if the player is in an offside position, or not. Assistant Referee will signal soccer offside to the Center Referee by raising the flag straight up in the air. Referees are not perfect, and they will make occasional mistakes when signaling offside in the game, due to the small margin of error in staying onside, or being offside. Player is in an offside position if the ball is passed to him, when he is behind the last defender, making it a 1v1 situation with the goalie. Offside is called from the time ball is kicked towards the attacking player. Its 40th minute and the attacking team has the soccer ball in the midfield. Midfield player dribbles past one defender and than makes eye contact with the Forward to start making a run forward. The Striker is anxious to score and starts his run one second early, causing his running stride leg to get behind the body of the very last defender, at the time Midfield player makes contact with the ball for the pass. Referee will look at the pass when the passing player actually made contact with the soccer ball. In this example flag would have come up and the whistle would be blown for OFFSIDE. The attacking players leg was behind the last defender at the time of the pass, giving the attacker 1v1 advantage situation with the keeper. The play is stopped and the ball is awarded to the defending team. 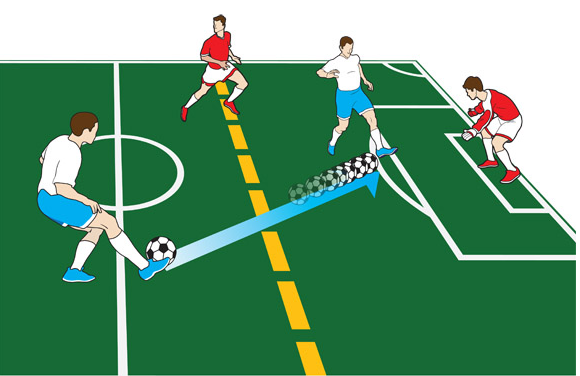 Offside rule in soccer is an advantage to the attacking player that is taken away, making it harder to simply camp in front of the opponents goal, and wait for the soccer ball to score goals. Any part of the attacking players body found in advantage position at the time of the pass, will be called offside. Making just one step ahead of the last defender, when the ball is passed to the attacker will cause offside rule infringement. Forward players have to learn how to anticipate passes, and wait until the ball is kicked forward before starting to sprint after it. Running sideways or diagonally is a great way to avoid offside for attacking players, while making runs in a straight line will cause the attacking players to be caught offside very often. Offside rule is broken whenever any part of the attacking players body crosses past the last defender on the soccer field, at the exact time that the ball is kicked towards the attacking player. Referee calls for offside rule infraction when the attacking player makes an early run past the last defender, with any part of his body behind the last defender, when the ball is passed forward. Attacking player has to attempt to play the ball to be called offside. Passive soccer offside is when an attacking player is in an offside position, but is not attempting to play the ball or be involved in the play. Instead the player jogs back or stands still, not interfering with the game of play. This is called a passive soccer offside rule and the play will not be stopped. One more thing I want to point out is that offside will not be called if the attacking player makes a pass dropping the ball back to a lone attacker. Passing the ball backwards will not be called offside. Player A runs up the field making a perfectly timed run and receives the pass to go one on one with the goalkeeper. His teammate, Player B, is following and running behind Player A, screaming for a pass to score a simple tap in goal. Player A CAN make the backwards pass, no matter where the defending players are. Because the ball is passed back, there is no offside. This also works with crosses. Offside rule in soccer may be confusing right now, but once its understood, you will be able to call offside before the referee does. For more information on offside in soccer please visit FIFA Law 11 - Offside Rule in Soccer.